Epic Games’ PAX West 2018 vivestream showed off Fortnite‘s upcoming High Stakes event. It will add a new limited-time mode, various skins (including the wild card outfit), and the grappler gun to the game when the next big update drops. 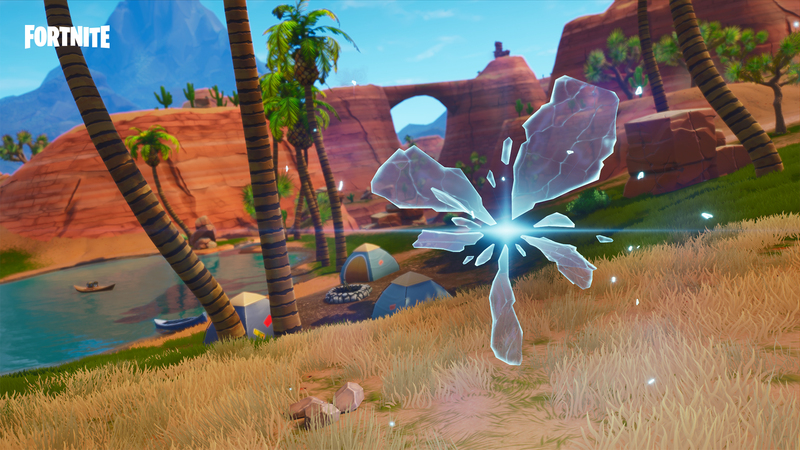 In The Getaway LTM, four loaded safes are scattered around the island. Each one contains various loot and, more importantly, a large jewel llama. It’s a sort of battle royale heist, in which the first four teams to make their way to a getaway van with a jewel win. This van appears to be suspended in the sky by a hot air balloon, so you’ll definitely need to build your way to victory royale. It takes ten seconds to crack the safe, during which point you’re essentially a sitting duck. Ideally, you’ve cleared that area of any enemies and your teammates are on the look out. The eye of the storm is still at play during this LTM, but the livestream footage suggests the safes seem to be more towards the center of the map. The grappler offers a long-range travel option, easily and quickly allowing players to latch onto an environmental element and propel themselves upwards or across the screen. It seems perfect for quickly traversing areas or surprising your target with a close-range shot before they know what hit them. These constant updates, challenges, LTMs, and the general lore all help keep Fortnite fresh. The only question is what will Epic Games do next?